Chestnuts, sure you've tried them before but have you tried picking them yourself? It's a tough job but packed with hours of outdoor fun and enjoyment, a great experience for all. Chestnuts are delicious and fragrant with a distinctive taste. They can be eaten in a variety of ways –boiled, fried or roasted, and have a unique nutritional make up which allows much more versatility than most nuts. We generally picture chestnuts as an edible yellow centre with a smooth, glossy brown outer shell. But did you know that before harvested, chestnuts are covered by a prickly shell called a burr? While most fruits –peaches, plums, strawberries, cherries and other berries are available for picking during the Summer months, Chestnuts are available for picking in April and May. Chestnut Springs is located in Gembrook, close to the famous Caridinia Reservoir Park and minutes away from the Rj Chambers Flora and Fauna Reserve. There are more than 100 chestnut trees at the orchards and they are open on Fridays, Saturdays and Sundays in April from 10:30am to 4:30pm. However it is always best to call up before your visit to make sure you don't miss out. Fun for the whole family, children of all ages are welcomed too. The beautiful lake on the farm, perfect place for a quiet picnic, read and spend time with the family. 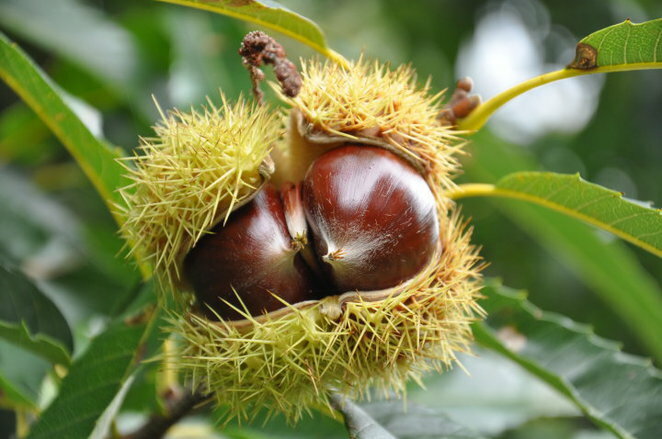 You will need to bring your own pair of thick rubber gloves for chestnut picking. This is because the outer shell is very sharp and prickly and almost impossible to touch with your bare hands. It's also a good idea to bring plastic bags and wear sturdy waterproof shoes in case of rain and mud. Don't forget a bucket to carry your freshly picked chestnuts around. Bring gloves that can protect you from the sharp pricks! 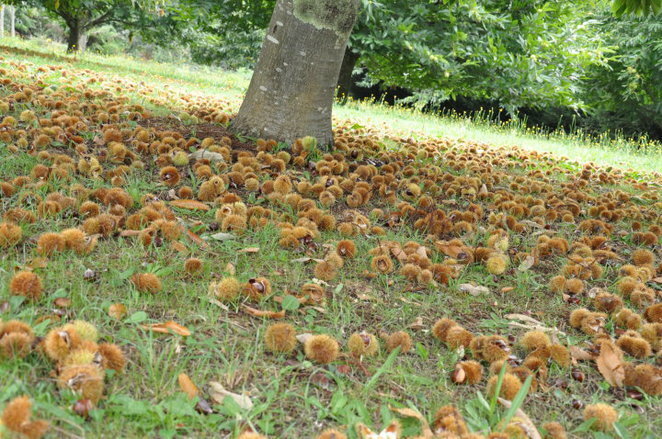 When ripe, chestnuts will fall to the ground and scatter along the ground, whereas the bright green ones are not yet ripe and require some more time to grow. 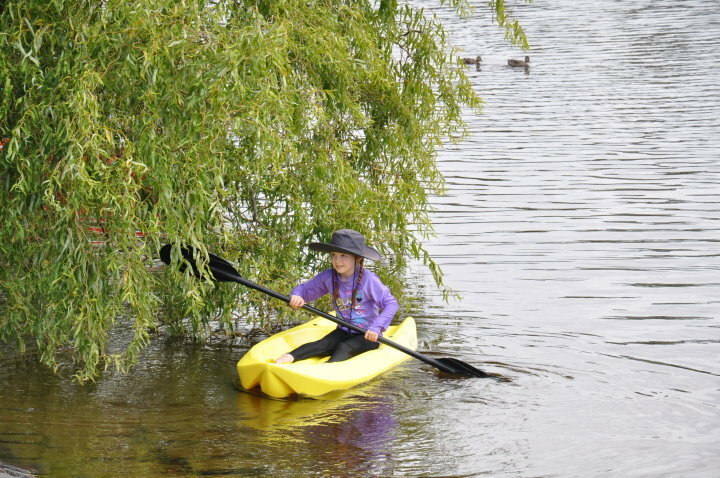 Besides the chestnut picking which is tonnes of fun already, other attractions include the giant lake in the heart of the farm where you can enjoy water activities or a quiet picnic and the farm animals that roam about who make this quiet little farm their home. Chestnuts are unique because of their low fat and high moisture content compared to other nuts. Unlike other nuts, chestnuts are made of mostly carbohydrates which makes them more akin to a grain. They are high in fibre, low in calories and rich in complex carbohydrates and Vitamin C.
I love finding chestnuts on the ground, but to go to a farm to pick them would be wonderful. I think that would be even better than fruit picking. Are opening on Easter public holiday? Is the farm open on this Satuday? Chestnut Springs will be open at Easter 2018..... plenty of chestnuts on the trees and they'll soon be ready to drop! Are you open on Monday 9/4?